Lauren Gawne is a linguist who works on the documentation of linguistic diversity, particularly in Nepal. She is interested in grammar, gesture and the creation of language documentation archives. 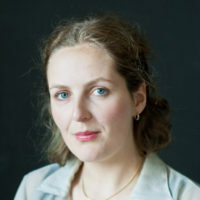 Lauren is currently an Endangered Languages Documentation Programme Postdoctoral Fellow at SOAS, University of London. She writes about language and linguistics on her blog (Superlinguo), and unlike Daisy Bates is very happy to get about in flat footwear. You can chat with her on Twitter (@superlinguo). When the Dangerous Women Project started, the first woman who came to my mind for the title of ‘dangerous woman’ was Daisy Bates, a woman who spent most of her adult life living amongst different Australian Aboriginal groups, recording their language and culture while attending to their wellbeing. Born Margaret Dwyer in Ireland, her early life is something of a mystery. In 1882 at the age of 23 she migrated to Australia, having changing her name to Daisy May O’Dwyer. It was her marriage to John (Jack) Bates in 1885 that gave her the name she would carry for the rest of her life. Daisy Bates, it turns out, is a good name for a dangerous woman; American readers may be more familiar with the 20th Century American civil rights activist, publisher, journalist Daisy Bates who played a key role in the Little Rock school integration crisis in the 1950s. Daisy’s marriage to Jack was not her first. In 1884 she married Harry Morant,  who is known better in Australia as Breaker Morant, the bush poet and army officer sentenced to death by the British during the Boer war for the summary execution of a prisoner of war. The marriage was never annulled, and her bigamous marital status was kept secret during her lifetime. I came to know about Daisy Bates while working as a research assistant on the Digital Daisy Bates project, based at the University of Melbourne. In her lifetime Bates had a common set of wordlists printed up, that she would use whenever she encountered a new speaker of a new language or dialect. This project is working to digitise and share these documents. The collection includes over 8,600 pages of manuscript, with languages from across South Australia, Western Australia and the Northern Territory represented, and at least 123 speakers named. She herself said that she was “acquainted with 115 languages” of Australia,  and by the time of her death an obituary in the Sydney Morning Herald stated that she spoke “188 aboriginal dialects”. Bates was always good at overstating things. It is the iron will and self-reliance that are so compelling in the story of Daisy Bates. She never gave up her Victorian era boned jackets and long skirts , even walking many miles in raised-heel boots, or single-handedly digging a 5-foot deep grave when one of her patients passed away. She was a self-avowedly terrible cook, more or less surviving for years on porridge, damper bread and tea. Whatever maternal feeling she had was not spared for her son, but instead invested in the Aboriginal ‘children’ of her life in the desert. She sold all of her land and goods to dress and feed them, even at the age of 74 she would write journalistic correspondence about life in the desert when her funds ran out. Bates spent the majority of her adult life among various Aboriginal groups of Australia. The archive of her work is, for some languages, the only real record that we have. She undoubtedly cared for many people, and endured many hardships to aid them. She did all of this with little regard for those who thought it was work too dangerous or difficult for a woman alone. Bates was a dangerous woman, but her legacy is also dangerous today. Although she willingly took herself away from society, her approach to Aboriginal welfare was grounded in the strongest belief in the paternalism of Empire. In her own book about her time in the desert, The Passing of the Aborigines, and she saw herself as caring for a dying race of uncivilisable savages that was being “inevitably supplanted” [4, p. 90] by the superior forces of Colonialism. It is galling to see her matter-of-fact belief in the appropriateness of removing of “half-caste” children from Aboriginal camps, as part of the Australian Government’s policy that resulted in the intergenerational trauma of the Stolen Generation(s). Her reports of cannibalism amongst the Aboriginal groups of Australia were discredited during her lifetime, to her embarrassment,  but helped perpetuate a dangerous image of Australian Aboriginals. Bates, Daisy. The Passing of the Aborigenes: A Life Time Spent Among the Natives of Australia. London: Murray, 1966. Salter, Elizabeth. Daisy Bates:” The Great White Queen of the Never Never”. Angus and Robertson, 1971. Blackburn, Julia. Daisy Bates in the Desert: A Woman’s Life Among the Aborigines. Vintage, 2012.